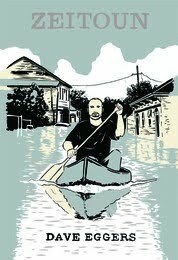 From McSweeney’s: When Hurricane Katrina struck New Orleans, Abdulrahman Zeitoun, a prosperous Syrian-American and father of four, chose to stay through the storm to protect his house and contracting business. In the days after, he traveled the flooded streets in a secondhand canoe, passing on supplies and helping those he could. But, on September 6, 2005, Zeitoun abruptly disappeared. Eggers’s riveting nonfiction book, three years in the making, explores Zeitoun’s roots in Syria, his marriage to Kathy—an American who converted to Islam—and their children, and the surreal atmosphere (in New Orleans and the United States generally) in which what happened to Abdulrahman Zeitoun became possible. Zeitoun was written in close collaboration with its subjects and involved vast research—in this case, in the U.S., Spain, and Syria.